Why is Samsung performing so poorly? The issue is not just a deceptive portrayal of percentages of growth. 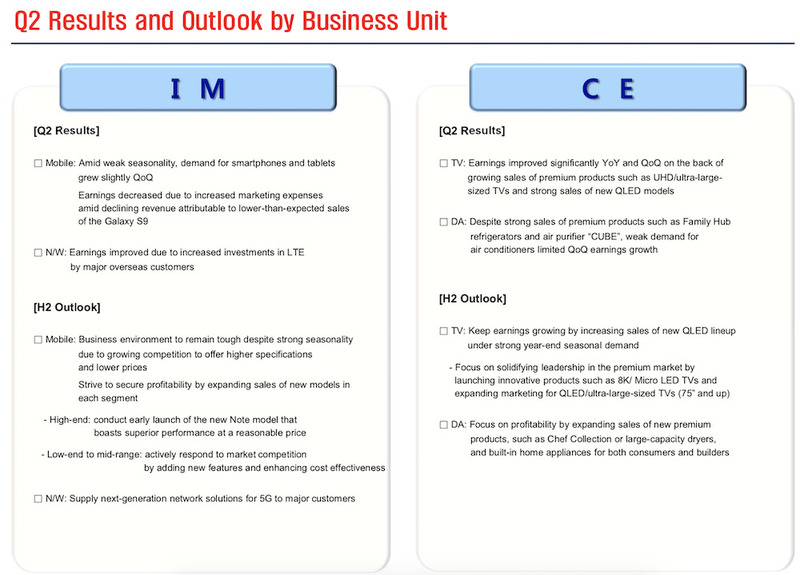 Samsung's calendar Q2 mobile revenues from its IM segment were reported to be 22.67 Trillion KRW ($20 billion). Apple's net sales for the same quarter were more than double that: $53.265 billion. Apple's sales are growing significantly despite having revenues twice as large as Samsung IM mobile, even as Samsung's mobile sales are rapidly dropping to unit levels last seen five years ago. Samsung's IM operating profits includes its mobile business comparable to Apple, plus its commercial networking equipment business all amounting to 2.67 Trillion KRW ($2.4 billion), while Apple's operating income for the same period was $12.612 billion. While chalking up twice the revenues, Apple's operating profits were over five times larger than Samsung IM. The majority of the revenues and profits of both entities come from sales of smartphones. In the second calendar quarter, Samsung shipped 71.5 million units. Apple shipped 41.3 million iPhones, just under 60 percent of Samsung's Q2 volumes. How is Apple making so much more money, despite selling fewer phones? In part, it's because Apple has successfully concentrated on the valuable segment of the market. That isn't to say Samsung hasn't tried to reach affluent buyers with more expensive phones; it has just failed to do so at Apple's level. A cynical pundit might imagine that Apple's more profitable iPhone sales could be explained away by incessant, clever marketing that fools people into not buying less expensive Androids. However, the reality is that it was Samsung that spent lavishly on advertising, marketing, and celebrity endorsements until it became infeasible to continue laying out $14 billion annually to promote the Galaxy brand. That was what Samsung was spending in 2013 as it approached the peak of Galaxy sales, while Apple spent about $1 billion on advertising and relying largely on brand loyalty to maintain sales. Five years later, Samsung's second quarter phone sales are at their lowest point since the beginning of 2013, or about 6 million fewer than it sold in Q2 five years ago. Apple's most recent Q2 iPhone sales were over 10 million higher than its Q2 sales from 2013. Note that five years ago was not only peak Galaxy, but also the pinnacle of analyst fretting over the idea that Apple had "lost its ability to innovate" while demanding that the company produce low-end iPhones priced around $300. Grilled about this in a conference call, Apple's chief executive Tim Cook stated at the time, "our growth will come from new services and products," adding, "I don't subscribe to [the notion that the] higher end of the smartphone market has hit its peak." Across the second half of the iPhone decade since Cook made his comments about higher-end smartphones, Apple's Average Selling Prices have risen dramatically —particularly with the introduction of new larger Plus models and the most recent luxury-class iPhone X models. However, it was Samsung that first pushed up prices of its most expensive Galaxy S and Note lines higher than Apple's standard iPhone price-point. While it wasn't the first to introduce big "phablet" handsets, Samsung is often credited with popularizing the big phone, and it gave the phablet a new, higher price tier. While nobody seemed to notice back when Samsung was working to boost the prices of premium phones, once Apple's ultra premium iPhone X raised the price of luxury phones to $999 and up, the media put on a show of shock and outrage, apparently without ever realizing that $999 phones existed before iPhone (even before considering inflation). 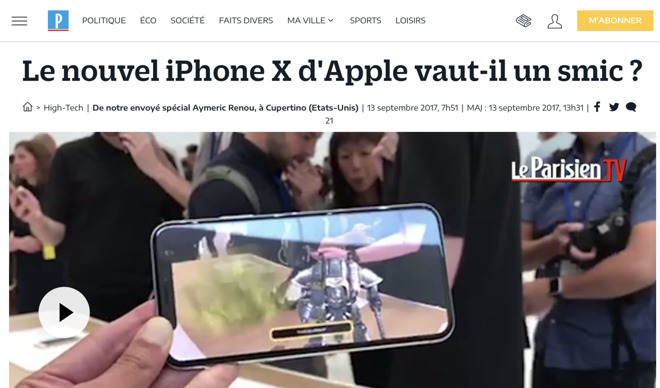 In France, Le Parisien gasped last fall that the new iPhone X was priced the same as the SMIC, the French minimum allowable monthly wage —at least once French taxes and the dollar exchange rate brought iPhone X to 1,159 Euros. How could the lowest paid workers in the country ever afford the most expensive luxury phone on the market? It appears that at least some of them found a solution. A few might have flown to New York to buy an iPhone X at a significant discount, but just looking at sales within France, iPhone X was Apple's most popular model this summer —well after its initial launch last winter —according to July data by Counterpoint. Sales were ahead of the less expensive iPhone 8 and all of Apple's other more affordable offerings. 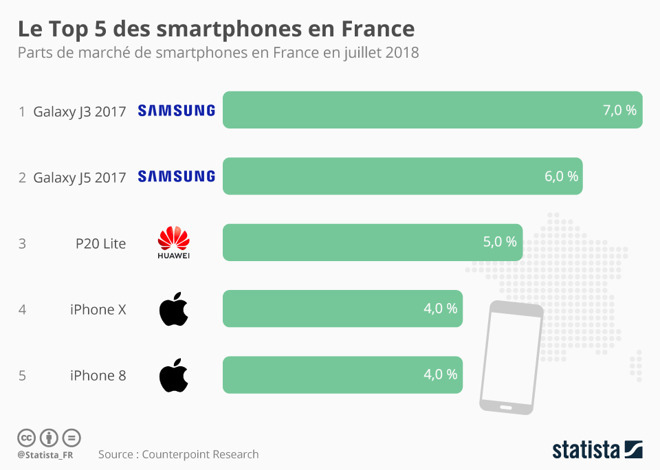 There were three other smartphone models that were ahead of iPhone X in French sales by units: two Samsung Galaxy J-series phones from 2017, and Huawei P20, a Chinese phone designed to look as close to a iPhone X as possible. But while Samsung was hailed as the leader du marche des smartphones (leader of the smartphone market) by Statistica "data journalist" Claire Jenik for having sold so many Galaxy J models, she neglected to note that the Galaxy J sells for less than 200 Euros, currently priced at 124 Euros on Amazon.fr. The Huawei P20 starts at 250 Euros. In July, the iPhone X was sold for 1160 Euros and iPhone 8 was 810 Euros. Noting that detail changes the picture dramatically. Among the top five French models, Samsung's 6 and 7 percent market share of ~200 Euro Galaxy J models obviously resulted in far less revenue than Apple's 4 percent of French sales captured by its highest-end phone priced at least 6 times higher. In fact, Samsung's Galaxy J units were outperformed on a revenue basis by iPhone 8, with a price roughly four times higher. It's not exactly a secret that Apple's revenues and profits are crushing Samsung and every other mobile and PC maker, but it is something that marketing data groups and "data journalists" appear to work very hard to obscure—either for dramatic purposes, to maliciously misinform, or just because they are simpletons who think nickels are bigger than dimes. Despite the media puffery that the prices of Apple's least affordable products are "too high," note that Samsung was also selling its Galaxy S9 in France for 860 Euros, with models priced as high as 1,060 Euros, with the the Galaxy Note 9 as high as 1,260 Euros. Samsung simply wasn't selling enough of those pricey models in France to enter the top five. In fact, the S9 turned in disappointing sales globally. That's not just some analyst conjecture cited by Business Insider clickbait. Samsung itself noted to investors this summer that despite the fact that "demand for smartphones and tablets grew slightly QoQ," the reason for its 34 percent drop in IM results was that "earnings decreased due to increased marketing expenses amid declining revenue attributable to lower-than-expected sales of the Galaxy S9." So one reason why Samsung is performing so poorly compared to Apple is that its fanciest phones are not appealing to buyers, while the high volume phones that it is shipping have to be priced so low that they can't contribute toward profitability. 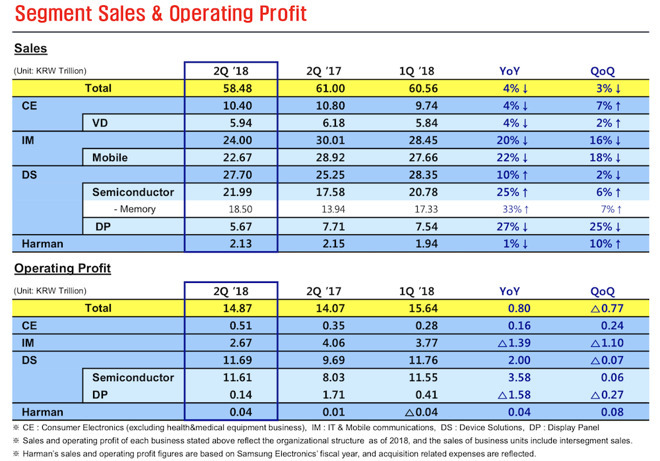 Note that while Samsung's phone shipments are indeed down in the most recent reported Q2 (having fallen by about 10 percent YoY) its profits were down by over three times that much. That makes it clear that each percentage point of market share is not equal in value. It's no secret that phone profits come from the top layer of cream. For Samsung, the cream collected from its Galaxy S and Note sales is thin —and is subject to wild swings based on whether it can drum up interest for new models or avoid major bungles like the Note 7 disaster. For Apple, the iPhone is all cream. There are no Apple phones that sell for $125 new from the factory, let alone in large volumes that make up most of its sales. That kind of low-end whey byproduct simply doesn't exist for Apple, and therefore can't compete with Apple's featured selection of premium models. In France, as in other markets, many buyers are opting for cheap smartphones, but overall, the votes by dollar are being awarded to Apple. Samsung's inability to successfully build high-end phones that attract attention is not the only reason why the largest Android licensee is failing. The Samsung IM mobile group also builds Windows PCs, Galaxy Book Windows tablets, Chromebooks, Android tablets (including new tablets running Android KitKat from 2013! ), Tizen smartwatches, fitness bands, wireless headphones, VR cameras and headgear, wireless chargers, and a variety of "smart home" hubs, sensors, and outlets. Yet, all of these products are collectively worth nearly nothing. Samsung's revenues and profits are tied almost exclusively to its smartphone sales, while all of these other products are merely placeholders seeking to find a new market—so far, very unsuccessfully. In fact, across ten years of increasingly competing with Apple since iPhone appeared and radically disrupted the phone market, Samsung has never broken out any significantly new, commercially successful product from its IM group. Contrast that with Apple. Across same period of time, Apple's Mac business roughly doubled in size. Apple introduced iPad as an entirely new platform, currently shipping 11.5 million units in the last quarter. Both businesses each generate revenues of about $5 billion per quarter, totaling half of what Samsung's entire IM mobile unit does. Samsung's vast array of Windows, Android, and Chrome computing devices are not any meaningful percentage of its IM mobile unit sales or profits. Beyond conventional computing devices, Apple also has an Other Products category that reported sales of $3.7 billion in the last quarter. That includes iPod, Apple TV, Apple Watch, AirPods, HomePod, and other accessories. Samsung makes many of the same devices, but none of them contribute enough to break out as their own category, and Samsung never even makes mention of these to its investors when talking about profits, because they don't meaningfully contribute to Samsung's business. Apple also has another business segment: Services, which includes the App Store, iTunes, AppleCare, Apple Pay and other services. Samsung has made stabs at attracting developer interest in proprietary apps for Galaxy devices, tried to launch its own Milk music service, invested a quarter of a billion dollars to launch Samsung Pay, and even worked to deploy Tizen as an apps platform. Yet, there's no visible contribution from any of these attempts. At the same time, Apple's Services has generated $9.5 billion in its seasonally slower summer quarter —again, nearly half of Samsung IM mobile's entire quarterly revenues. Note that analysts seem to just now be catching on to the idea of Services. But five years ago, Apple's "iTunes, Software and Services" segment was reporting $3.99 billion in quarterly revenues, greater than the combined revenues of HTC and Motorola —which was then owned by Google. 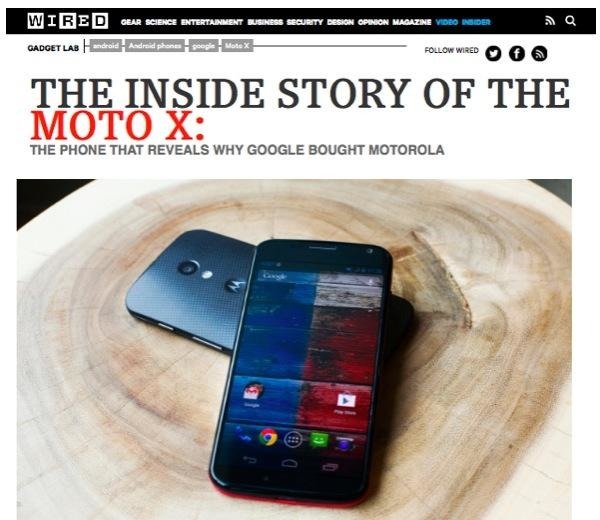 Rather than drawing attention to Apple's Services, everyone from the Wall Street Journal to Wired spent the year writing excitedly about the wonderful prospects ahead of Google's Motorola acquisition. Lest anyone think it was just $13 billion spent on patents, Steven Levy documented the fact that "the Moto X is the first in a series of hardware products that Google hopes will supercharge the mother company's software and services." Instead, Motorola burned through $704 million within just six months, before Google could sell it off for scrap. And while Apple's quarterly Services revenues have since more than doubled to $9.5 billion in Q2, Google's chief executive Sundar Pichai was able to excite analysts this year with the news that Google Cloud services (including its G Suite productivity tools such as Google Docs, Google Sheets and Gmail) were "already" $1 billion per quarter. Meanwhile, Google Play continues to service twice the downloads while earning half the revenues of the App Store. If all of this buildup and hype culminated in just a $1 billion quarter for Google Cloud five years later, imagine how negligible Samsung's services revenues are, given that it has no real cloud, software, or music sales at all. In retrospect, Samsung's efforts to replicate Apple—including those years when it was slavishly copying iPhone and iPad—have ended up an exceptional failure. Not only has it failed to build a similarly profitable phone business (and recall that Samsung is no scrappy smartphone underdog, but was instead a leading Symbian/Windows Phone handset maker back when the iPhone hit), but it has gone nowhere in its strategically scattershot attempts to instantiate the computing goals of Microsoft or Google, or even to build its own platforms from scratch. That's true even in areas where Samsung enjoyed a first mover advantage —such as with smartwatches —where it seemingly could have established a business in the years where it had no competition from Apple at all. 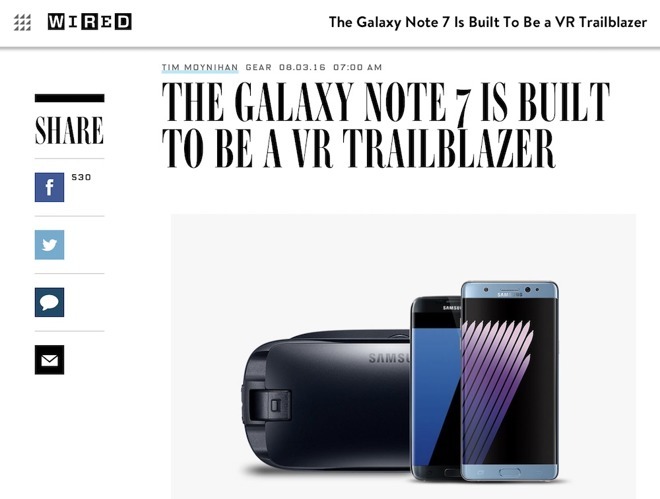 Samsung also went all in on VR with no competition from Apple, but couldn't turn it into a real business, in part because the "trailblazing" Note 7 literally burned it down. Do you recall what a trailblazer this was? Because Samsung had to recall every blazing one of them. Samsung's IM group also had a clear advantage in being closely associated with the company's other semiconductor component and display groups, which have been building state-of-the-art display panels, memory, and processors since before the launch of iPhone. Yet even at points where it could take advantage of new, internal technologies such as larger panels or OLED screens, Samsung's IM mobile group has snatched defeat from the jaws of victory. Within a couple years of Samsung gaining some traction for its larger phones, Apple introduced its own larger iPhones and crushed sales of high-end Samsungs. Outside of Samsung IM, the company has segments performing well in components, and is currently the exclusive supplier of OLED screens for Apple's high-end iPhones. However, Samsung's sketchy business practices resulted it it losing Apple's business as a chip fab, and it appears to also have been Qualcommed by Apple in DRAM and NAND memory. The reality was the Apple's flagship was selling incredibly well. It was Samsung's Galaxy S9 that was not selling well. So poorly, in fact, that Samsung Electronics' Display Panel unit turned in lackluster results despite having the coveted role of being the sole OLED supplier of the world's most popular smartphone, iPhone X.
Samsung's Mobile IM has shifted from a shining Galaxy star to an embarrassing black hole of a liability for the entire conglomerate. Android was supposed to be an open technology that would unlock markets and increase innovation. For Samsung, the world's largest Android licensee, it has instead ended up being more of a noose, resulting in the loss of critical business from its largest partner while doing virtually nothing to support replacement businesses from tablets to music players to netbooks and the other devices it was hailed to facilitate. Outside of Samsung, the new hero of Android is supposed to be firms in China. However, the profitability of the top Chinese brands (Huawei, OPO, Vivo, and Xiaomi) in the same Q2 was collectively reported to be about $2 billion, or about the same as Samsung's for the same quarter, according to data from Counterpoint Research. Those figures are all limited to the smartphone market. Counterpoint's data unbelievably suggests that Apple only made about $6 billion from iPhones in that quarter—less than half of the $12.6 billion in operating profits it reported. But when you consider that Chinese production of smartphones is still scraping the barrel in profits, it's pretty clear that these Chinese brands aren't somehow making tons of money selling PCs, netbooks, tablets, watches, headphones, VR gear and so on, any more than Samsung is. At the recent ten year anniversary of Android, various fans of the platform wrote platitudes about how Android has been so incredibly successful and deserves our eternal admiration. In comparison to Apple, that's simply not true. Android did help prevent any alternative competition from successfully growing—it leached critical attention away from Windows Phone, from Bada and Tizen, and from other mobile Linux distributions. But it hasn't returned its licensees to anything resembling a pre-iPhone world. In fact, the reality is that Google's mismanagement of Android, which I first outlined in detail nine years ago, limited it to being a hobbyist platform that's served largely a training wheels for Apple's iOS, a technological onramp for basic smartphone users to eventually trade up to a premium mobile experience. And as I wrote five years ago, the Google's implementation of the openness of Android has been a liability, not a secret weapon. Samsung, LG, Sony, Motorola, HTC, Blackberry, and other firms that were successfully building phones based on licensing Java on Linux before Google rebranded it at Android were not returned to industry leadership in profitability by the ostensibly open new version platform just because Google prevented Sun from licensing its own technology. Most of those companies have been effectively obliterated —if not directly by Google and Android, at least certainly not sustained by Android in a meaningful way. If you imagine that Samsung is better off being aligned with Android than having gone solo, you should look into how hard the company has worked to desperately free itself of Android on phones, watches and TVs, and how little attention it gives Android in its marketing, while focusing on its own brands and proprietary technologies that it does not share with other Android licensees. Nokia, the largest phone maker to resist joining Android, was independently tanked by Microsoft—suggesting that it wasn't solely Android wiping out mobile industry incumbents. In fact, given that every phone platform has struggled to survive (or to successfully branch into new categories including tablets and wearables), it's hard to avoid saying that all of this destruction was largely the result of Apple's competence in building attractive products.